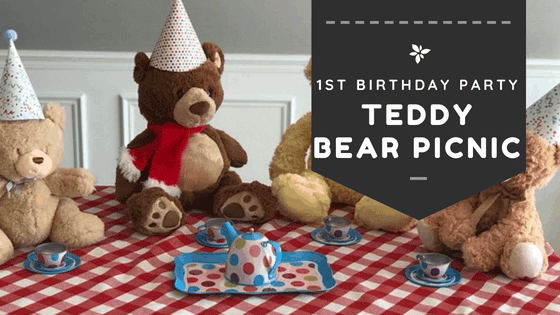 This post is all about a Teddy Bears Picnic 1st Birthday party. 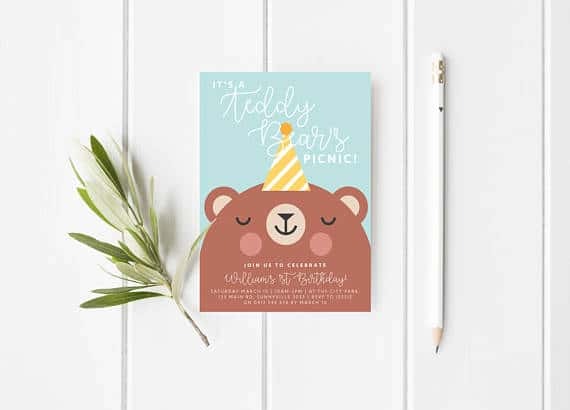 Included are invitations, decorations, printables, food and party favors ideas. My best friend Ann and I had our first babies 2 months apart. She was already pregnant when I invited her to meet me for dinner after work to tell her the news. 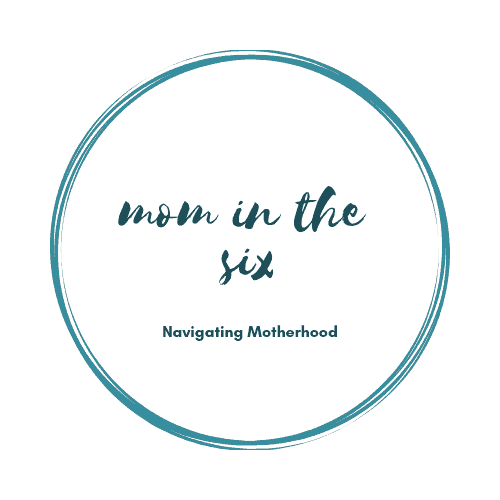 We have had the BEST maternity leave together (both of us have been blessed to have a full year off) – seeing eachother at least twice a week, sometimes more. We both also had daughters, which has been so special. And now that they are a little bit older they have started to play together and are becoming best little buddies. This month Claire has reached her first birthday and Ann is headed back to work. It has been hard for all of us. But it was inevitable. My time will come too. To get through the anxiety of returning to work, Ann threw herself into Claire’s first birthday. And she knocked it out of the park. Almost from birth, Ann has called Claire; Claire Bear. 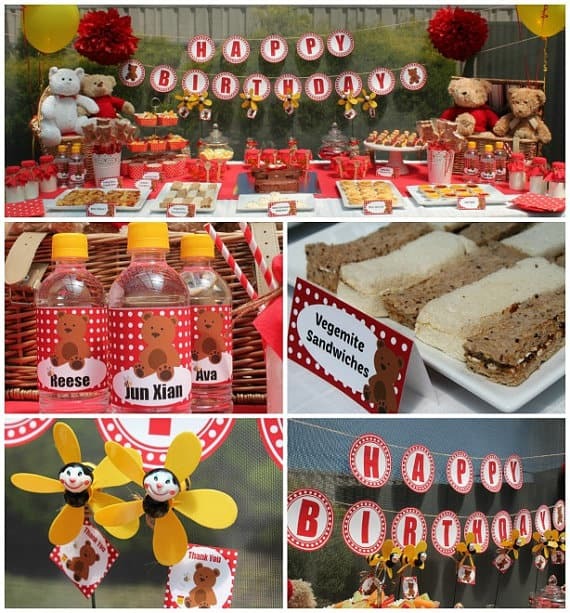 So when it came to picking a theme for the birthday a Teddy Bear Picnic was a perfect fit. 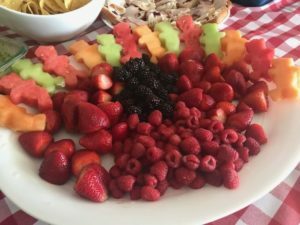 Here are some photos of the party with the links to where Ann purchased or DIY’d the decorations with a few extra ideas included. Teddy Bears Picnic is perfect for little ones who love their stuffed animals, which makes it great for 1 year olds. This post contains affiliate links. If you make a purchase Mom in the Six will make a small commission at no extra expense to you. For our full disclosure policy click here. 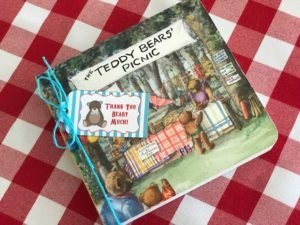 The Teddy Bears Picnic is a book or song many of us know from childhood. “If you go down to the woods today…” It is also a perfect theme for a 1 year old’s birthday. Why? Because they LOVE their stuffed bears. It’s also relatively simple, super cute and flexible – meaning you can have your “picnic” inside or outside. Digital invitations mean you can print them yourself and mail, attach to an email, or upload to an online invitation website. 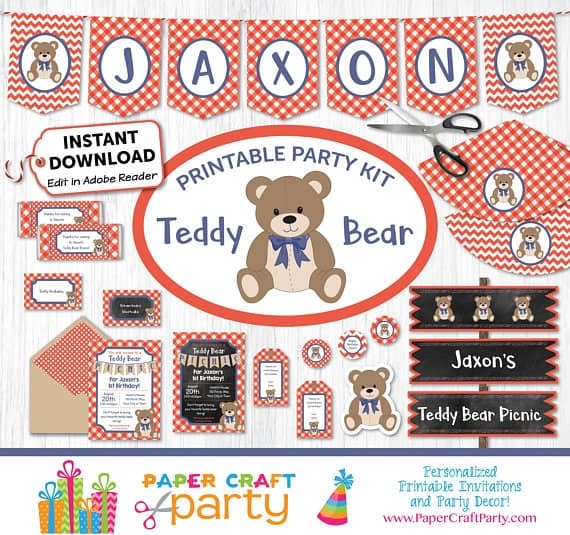 These finds from Etsy can all be downloaded and customized with your party’s information. This invitation is a personalized digital download – the store will take the information you provide and send you a completed digital invitation. No extra work for you! I love the modern look of it and it is also gender neutral which is nice. 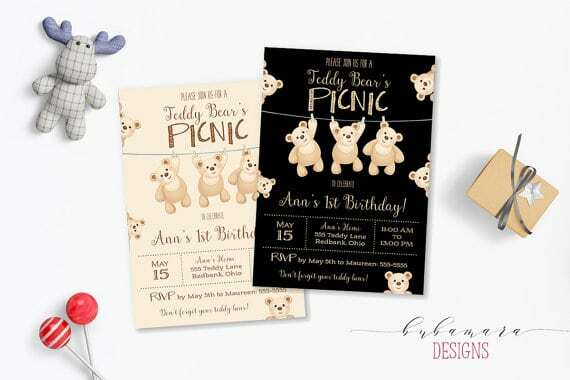 Choose between the black or cream background, these invitations are also sent completed with your information so you don’t need to format yourself. Choose between a chalkboard or white background. This invitation is editable when you receive it. Teddy Bears – Borrowed or already owned, wearing hats and placed in a circle having a picnic. 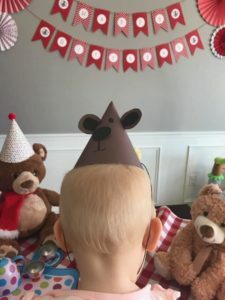 Teddy Bear Party Hats for Guests – Ann made hers, but here is a very similar one you can buy already done. How. Cute. Are. These. 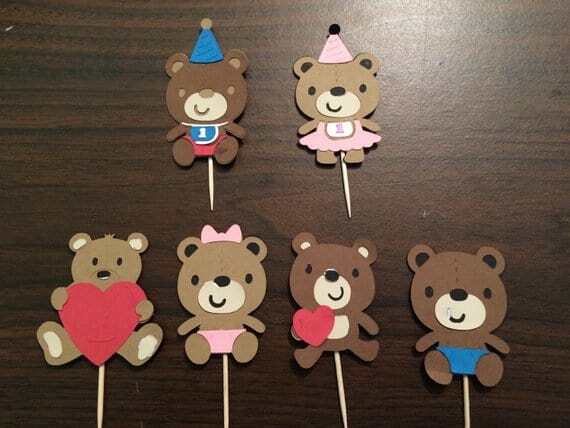 This store provides 24 cupcake toppers and you get to choose between the boy or girl bear and can put the number 1 on their outfit. Yes please! These signs include quotes from the song and are perfect for the dessert table and other area needing a little decor. 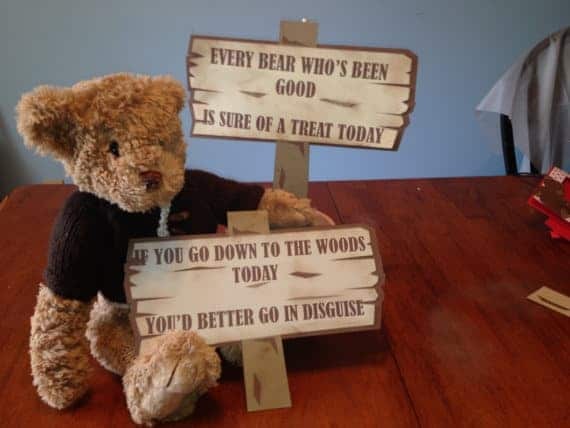 Place a mask on the Teddy Bear holding the disguise sign for an extra special nod to the song. The simpler the better right? 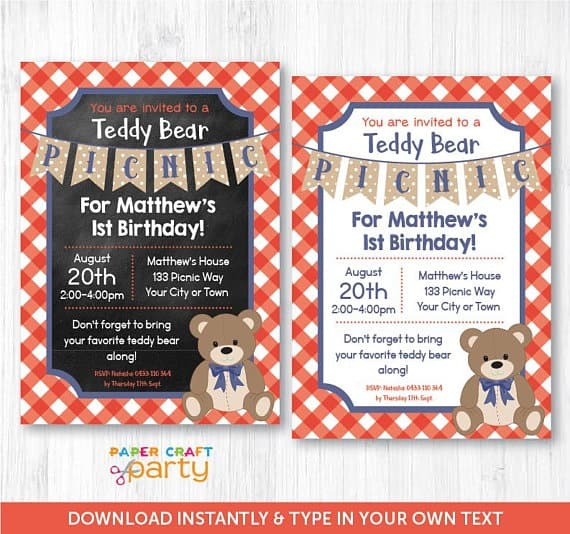 In addition to the free printables in the decorations section above here are a few Etsy vendors who have put together a digital download of various party decorations. This digital download includes 4 PDFS: Banner, food tent labels, blank water bottle labels and favor tags. The theme colors are red and white with brown teddy bears. A great download for easy decor. The water bottles are a nice extra. Another digital download. This one includes a LOT of goodies including invites, table signs, gift tags and banners. Pies were on the menu at this party – way more picnic-y then a cake! Pie Topper – Ordered from this Etsy shop. I love that cake/pie toppers can be kept and used again or kept as a keepsake. Imagine your 1 year old throwing a party in 30 years for their baby using the same topper *tear*. Sandwiches and easy to grab food was served including these adorable fruit bear cut-outs using a Bear shaped cookie cutter. Most of the party guests were parents or very young children, so the activities were kept very simple. 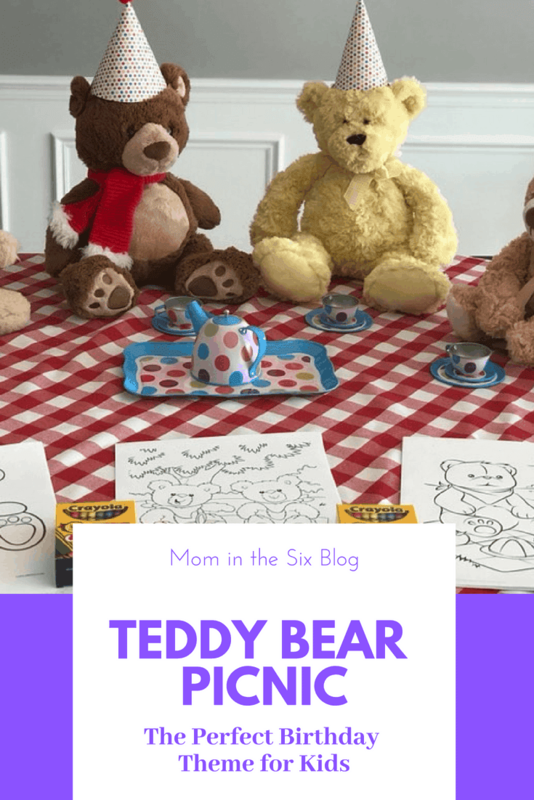 Teddy bear coloring pages with crayons. Just take one coloring book and carefully tear out the pages and create a Coloring Station. Add a few bears or other stuffed animals to “supervise” the area. I love giving a book as a party favor at this age. SO much better than a bag of candy or small choke hazard toys. Ann found a great board book from Amazon that Claire gave all of her one year old friends. One year olds are just starting to get into things like coloring, these crayons will be a hit for sure. Pair with a teddy bear themed coloring book. The day was fantastic and all the guests had a great time. 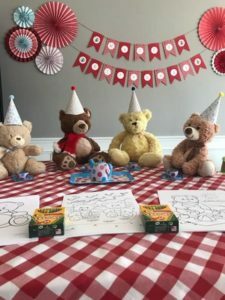 A Teddy Bear Picnic was a great theme for a first birthday party and I know both Ann and Claire have great memories of the day. This seems so perfect and doable! I love how you made everything simple and fun! I have 3 year old girl, she would love this picnic theme. Thank you for putting it together. Oh my goodness! Such a sweet idea! I love it. My daughter just had her first birthday. It’s only a couple of days after my son’s, so we just threw one big party. He’s 4, and he chose mickey mouse, so she didn’t get a cute baby party! Next year she gets to pick I hope! Baby girl parties are too fun. What a fun idea! I have a little girl and I am so excited to do something like this with her when she gets a little older! Too stinkin’ cute! 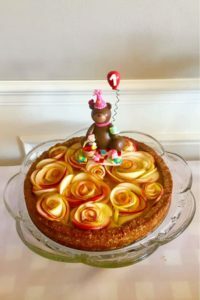 I am in love with that birthday hat and pie! The hat is so adorable and that pie… YUM! Such a beautiful looking party for little ones. Lovely ideas and easy to execute. Thanks for sharing. The bear hats are so cute! What a lovely little theme! What a cute birthday theme! I love that I have never seen this idea. I adore the party favors! This is adorable. 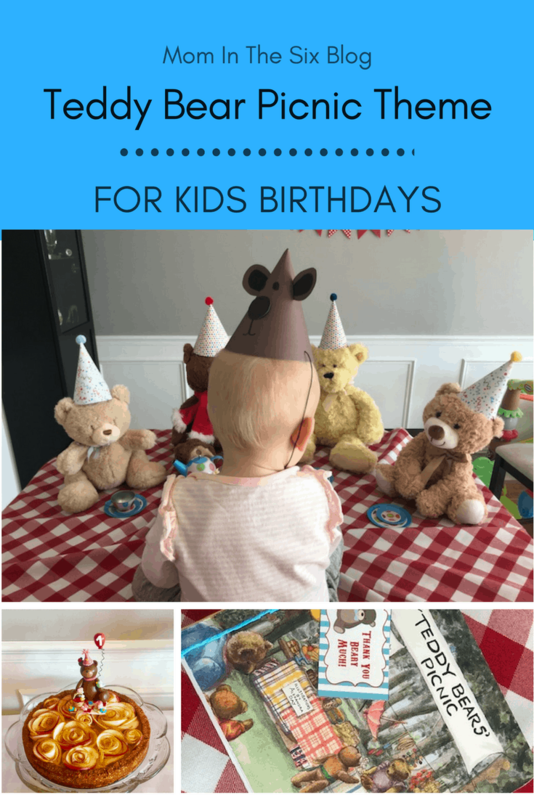 I love this and it’s fun to do these things for kids birthdays! What a cute theme! And it fits her nickname “Claire Bear” perfectly! Very creative. I particularly like the bear shaped fruit-Healthy and fun! Thanks for sharing. Oh my goodness, this is SO adorable! I loved the Teddy Bear’s Picnic. What a cute idea and I absolutely LOVE the cake too!